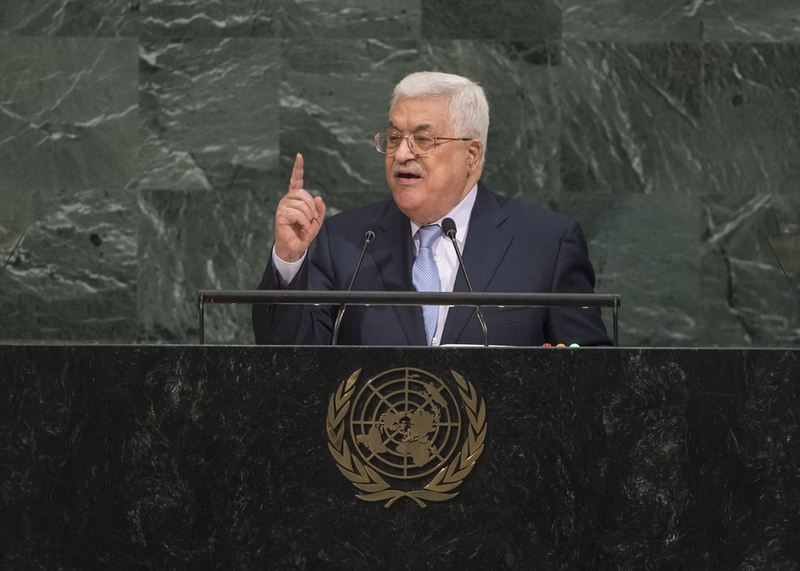 MAHMOUD ABBAS, President of the State of Palestine, said 24 years had passed since the signing of the Oslo Accords, an interim agreement that set a five-year period for ending the Israeli occupation. Today, he asked what was left of that hope. Israel continued to pursue its settlements, breaching all international conventions and resolutions on the question of Palestine. The United Nations bore a legal, moral and humanitarian obligation to end the occupation and enable Palestinians to live in freedom in their independent State, with East Jerusalem as its capital along the 4 June 1967 borders. Doing so would deprive terrorist groups of a rallying cry that they exploited to promote their repugnant ideas. Palestine had explored every avenue and exerted every effort to achieve peace with Israel, he said, having adopted the Arab Peace Initiative, which aimed to resolve the conflict by recognizing and normalizing relations with Israel in exchange for its withdrawal from Palestinian and Arab territories occupied since 1967. Israel had rejected that effort, and, similarly, the 2003 Quartet road map for peace, and the more recent French proposal that had led to the Paris Conference which Israel boycotted. Palestine had called on Israel to respect the historic and legal status quo of the holy sites in East Jerusalem, but that Government had repeatedly attempted to change the historic status quo of Al-Quds and Al-Aqsa Mosque. Despite the occupation, Palestine had managed to build its State intuitions, which had been recognized by a majority of Member States. “The two-State solution is today in jeopardy,” he said. Palestine had called on the International Criminal Court to open an investigation and prosecute Israeli officials involved in settlement activities, and would continue to pursue its accession to international conventions, protocols and organizations. Palestine had upheld its responsibilities towards its people in the Gaza Strip, repeatedly affirming that “Gaza will not be the Palestinian State” and that “there can be no Palestinian State without Gaza”. He expressed gratitude for the agreement reached in Cairo aimed at nullifying measures taken by Hamas following division of the area and formation of a government. To save the two-State solution, he urged the United Nations to help end the Israeli occupation within a set timeframe and implement the Arab Peace Initiative. It should work to end all settlement activities in the Occupied Palestinian Territory, including East Jerusalem; ensure international protection of the land and people of the State of Palestine in line with resolutions 605 (1987), 672 (1990), 673 (1990) and 904 (1994); and demand that Israel commit to the 1967 borders as the basis for the two-State solution. He similarly urged Member States that recognized Israel to proclaim that their recognition was based on the 1967 borders, and thus align themselves with international resolutions. States should also end their involvement and support to the illegal Israeli colonial regime in the occupied State of Palestine, he said, pressing those that had not yet recognized the State of Palestine to do so, in fulfilment of the principle of equality. For its part, the Security Council should approve the State of Palestine’s application for full United Nations membership, while the broader international community should continue providing economic and financial support to Palestinians to achieve self-reliance, as well as support the United Nations Relief and Works Agency for Palestine Refugees in the Near East (UNRWA).